Last night Cathy and I had the opportunity to talk to the Library Board about Teen Services, and it got me thinking--do all of our teens know about all of this? First, the biggest excitement of the past year: Teenship! You can see from the previous entry that we renovated our Teen area last fall. We are SO happy with the outcome, and hope you all enjoy it as well. A couple more exciting new features will be added soon! We also are working on our Teen book collection. We added a ton of new shelf space for our graphic novels/manga/comics, and are excited to continue growing that collection. We also started interfiling our audio books with the Teen Fiction so that they are easier to find. And if you have noticed the big purple curved shelf in the middle of Teenship--that now houses our "Teen Fiction Stars"--popular series such as Harry Potter, Percy Jackson, Maze Runner, the Lunar Chronicles, and more! Have you heard about our Teen Friends group? They are a group of teens that meet once a month to discuss programming ideas, give suggestions for the collection, and help make the library better for all of the teens! If you're interested in joining, drop into one of our meetings on the fourth Tuesday of the month at 6pm. We have snacks and a ton of fun together. And now my favorite thing: programming! We have a number of monthly programs for our teens. On the first Tuesday of the month we have our 'Wizarding World' club, where we do different Harry Potter-themed activities. On the second Friday of the month we have Teen Pizza Fridays, where our teens can come and eat, play games, or just hang out. It's afterhours so we have the entire library to ourselves! The third Saturday of the month is Anime Club! If you're a fan of anime or manga, you can come and meet alike-minded group of people and have lunch and some time to enjoy some anime. Finally, we have our new TeensTogether group. It is an organization aimed at teens going through any sort of issues, but it is geared towards LGBTQ+ teens. Anyone is welcome to join us, as long as they are accepting and supportive! TeensTogether meets on the fourth Tuesday of each month after the Teen Friends meeting. The new sign is up! 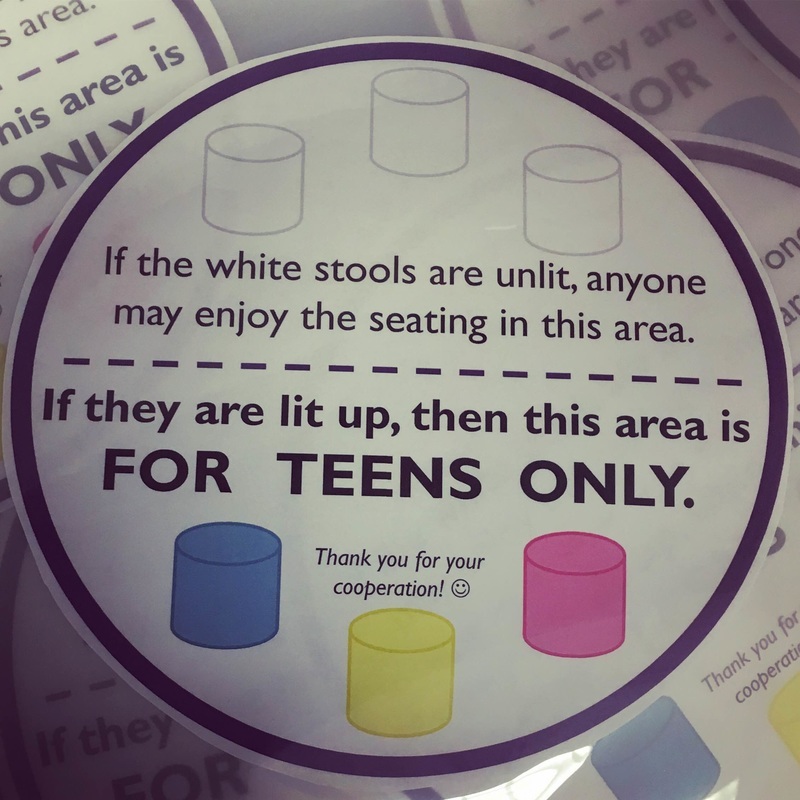 Along with the sign, we also set up a new rule for Teenship--when the white stools are unlit, anyone may sit in the area...but when they are lit up, it is for TEENS ONLY! We are excited to give you guys a space that is just for you! Our new Teen Area is just about finished! We celebrated with a ribbon cutting on Friday, September 9th. 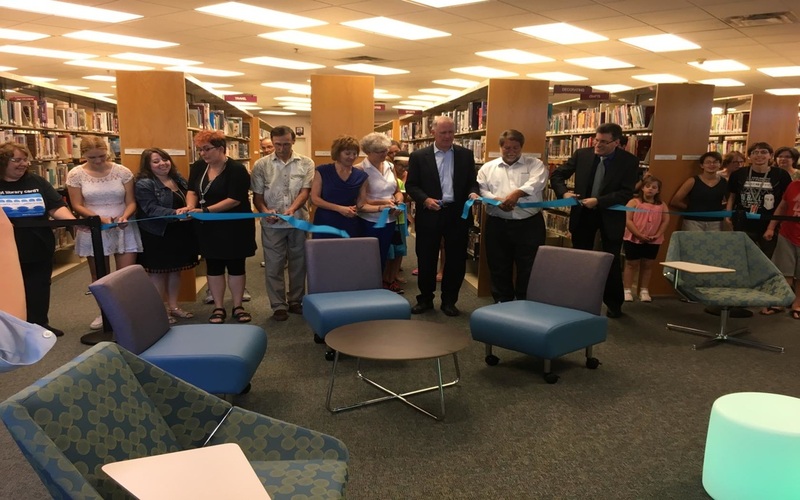 We are so grateful to Senator Ranzenhofer, the Friends of the Chili Library, and the Gates-Chili Chamber of Commerce for all of their support so that we could make this happen! 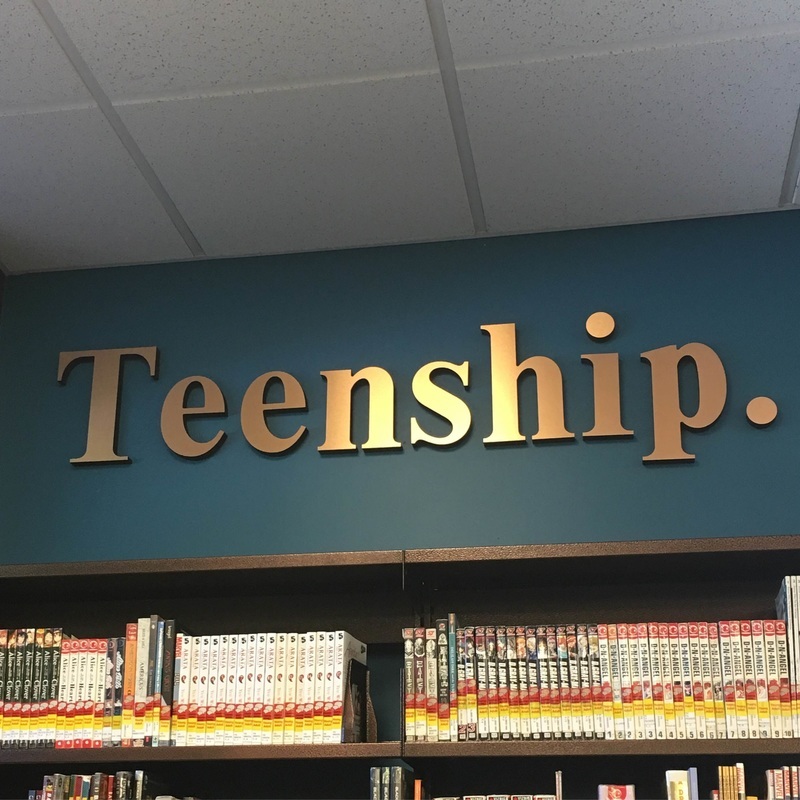 And of course, we are most thankful for the input of our Teen Friends, who supplied us with their vision for the area and bestowed upon it a wonderful new name: Teenship. We made an Instagram account just for our teens! We will be posting Teen program photos, YA book stuff, and other fun nonsense. Even without all your suggestions (shame on you!) we have been getting a little farther each day to a real teen area. There will be pictures. Promise. Of both the current area and the potential furniture. However right now its cold and gloomy and a perfect day to hide under a desk. So if you've come in recently (you better have) we've been moving stuff around in the teen area. Jeff (the boss), Cathy (super librarian) and I have been trying to make the teen area, more, well, teen friendly. But its one thing for some adults to try and create it, its waaaaay better if you guys go about creating. In order to do this though, we need your help! So help! Check out the survey and post random thoughts of beauty. I'll keep the survey as simple as possible and you keep the answers as random as possible. I love glitter, unicorns, Harry Potter and TONS of buttons!